Headlines: Fishing over the last week has been very good. Warm weather this week will see improved fly fishing in all lakes and rivers, the baitfishing has been very good and there are plenty of fish being caught overall. Rivers:- Once again thunderstorms and rain have given many of our streams yet another boost of water this week. Reports have been fantastic from all the rivers in the mountains. Dry fly fishing has been excellent with plenty of Caddis, Mayfly and Midge hatches plus Termites, Beetles and Ants falls the fish are feeding well on dry offerings. Fish will still eat a well presented nymph at the moment too. Several anglers have reported catching nice Browns and Rainbows on Nymphs. Best method is to suspend a nymph below a largish dry fly such as a Stimulator or Humpy giving you the extra chance at hooking a fish. The Gungarlin, Eucumbene, Thredbo, Moonbah are excellent at present. Lake Eucumbene:- Fly reports from Eucumbene have really improved with some great reports of fish on Termites and quite a few midges starting to show as the water rises over some of the grassy bays. The lake is looking fantastic at Buckenderra and Seven Gates with lush grassy bays and quite a few fish moving in them early and late. A Midge pupa, Stick caddis, or small Nymph fished with a slow twitchy retrieve will produce in these areas. A beetle pattern on wind lanes during the day is another successful method at this time of year. Fish have not been large as a rule but there certainly have been plenty to cast at of an evening. Woolly buggers have been the pick of the patterns when searching as have Tom Jones or a Craigs after dark. Lake Jindabyne:- There are big numbers of Midges hatching in Jindabyne also. The lake is rising rapidly and flooding plenty of grassy bays. As the conditions warm there will be bigger hatches and plenty of fish rising. As in Eucumbene a Midge Pupa or Midge Ball (or both in tandem) are the go. After dark searching with a wet or streamer is a good option for a Brown or two. North Easterlies have made evening sessions a little difficult at times but there are still fish rising to Pupa and Midge balls in these conditions and are very catchable. Wading is neccessary to get out past some of the flooded grasses and bushes, which can be waist high in the water, this makes it easier to reach fish and not lose them in the shrubbery when you hook up. A short note about Jindabyne last night, usual story looked perfect, midge everywhere, dead wombat still in fine olfactory form, not a lot of fish moving early on but what was were very good fish. A few more fish joined the party on dark, but the midge weren't really balling up, those fish moving were more on pupae. We connected with 4 fish all up but none were grassed the hook fell out of each of them. I'll be back on Thursday night for another round. As for flies 2 took the midge ball, 1 on a pupae and the other on the poodle. Vince dropped his fish on the poodle, forgot to say "Go the poodle". Me I just couldn't keep them on the end of my line long enough, was in fine long range release form. Best areas to look at in Jindabyne are Kalkite, Creel Bay, Curiosity Rocks and Hatchery Bay. Lake Tantangara :- There have been good numbers of fish on the chew in Tantangara and most of these have been surface feeders. Eucumbene:- With the rising water launching will become progressively easier. Below are photos from Buckenderra on the weekend with a solid boat being launched easily. Plenty of trolling access from there now. 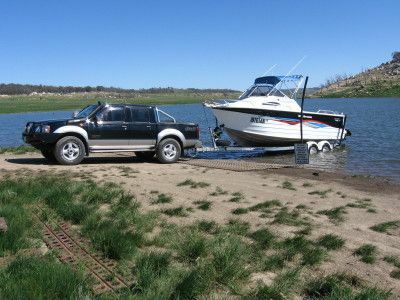 Launching access is available at Old Adaminaby, Anglers Reach, Dam Wall and Buckenderra. Trolling has been at its best late and early in the day. 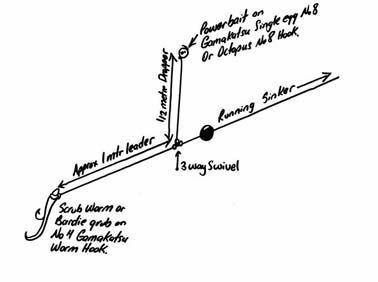 Though a search with a shallow runner in a windlane will quite often produce a few fish. The other alternative is to run a downrigger or lead core line and fish the deeper sections and channels of bays or in the main basin. Most of the reports suggest flat lining in close is the best option. Tassies, Lofty's, and Alpine Cobra's are great for this work. With Pink, Orange and Black, and the Bumble Bee Tassie Devils performing well. The little RMG Scorpion is another great lure for trolling in close in the new colour R32. *The Doherty boys, Neil, Ray, Perce and John have a good time at Buckenderra this week with 13 Rainbows and 3 Browns on a mixture of Tassie Devils, Powerbait and Scrub Worms. *The nineteenth Diplomatic Fishing Tournament took place during the weekend 16-18 November 2007 at Buckenderra Holiday Village on Lake Eucumbene. Ninety participants from 11 diplomatic missions and the Department of Foreign Affairs & Trade together with family and friends took part (but not all fished) in this keenly contested tournament and social weekend. Overall fishing was very good, with just over 50 anglers being successful and 135 fish weighed-in with an average weight of 386 grams (since only the heaviest fish caught counts, not all fish were weighed-in). 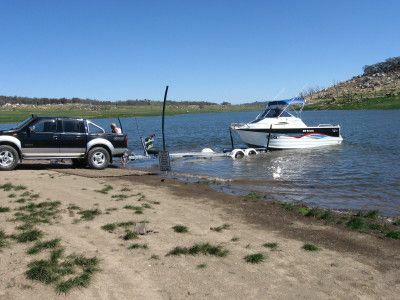 With Lake Eucumbene still rising, bait fishing was the most successful, with 92 fish caught by this method, 38 trolling and 5 on fly. The British High Commission won the sought-after team event for the first time, with the heaviest three fish caught by its team comprising Lindy Connolly, Julia Bell and Ross Rowe, totalling 2.1kg. The Embassy of Afghanistan came second with the Embassy of Spain in third place. Fourteen year old Alex Rickman fishing for the Embassy of Afghanistan won the Individual Grand Open Competition with a lovely 1.2kg brown trout caught on lemon sherbet powerbait at the power lines at Tollbar, while Monir Faehadi also for the Embassy of Afghanistan won the fly fishing trophy with a 0.7kg rainbow trout caught on a midge pupa at Seven Gates. The Individual Adults Division was taken out by Lindy Connolly from the British High Commission, with a 1.1kg brown trout caught at Buckenderra Arm on a worm. The Juniors Division (under 15 years old) was won by a very excited Irene Herrero fishing for the Embassy of Mexico with a nice 0.6kg brown trout caught on bait at Buckenderra Arm. Best areas have been the Dam wall, Old Adaminaby, Grace Lea, and the area off Seven gates. Jindabyne:- With the rising levels the weed beds are the place to troll. Being in close is the key as is an early start. If you really want to catch a fish being on the water as the light starts to improve is essential. As with Eucumbene, Tassies and shallow running minnows are the go in close. small Rebel Crickhoppers work well here too. Pink and Yellowing Tassies are always solid performers at this time of year too. Best spots to troll have been Sids Bay, Creel Bay, Kangaroo Bay, the bank between Sid's and Kalkite and the islands adjacent to the township. Bait fishing has been very good in Eucumbene with good Browns and Rainbows coming in from the Old Adaminaby and Seven Gates area. Powerbait and Scrubworms have been the best baits. Stimulate has been an excellent addition to Scrubworms and those anglers using it have reported a jump in their catch rates. We now have Bardi Grubs back in stock. Mudeyes have started to work and with the warming conditions will really come on over the next few weeks. Areas to look at in Jindabyne are Kalkite, Hatchery Bay, Creel Bay, Sids Bay, Clay Pits, Stinky Bay and Hayshed Bay. In Eucumbene try the Seven Gates or Old Adaminaby. 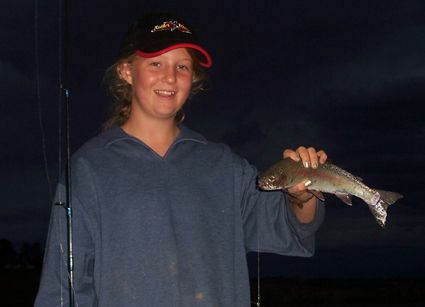 *Above, Jan with on of three nice Rainbows caught at Eucumbene on Worms and Powerbait. *Hi guys  my daughter and I called in on the weekend and got some bardies and worms. That afternoon after the storm we fished from the bank for a short time and ended up with 4 nice fish, the largest a brown 1.3 kgs cleaned. Next morning we trolled up another 2 nice rainbows on frog flatfish. Once again thanks for your time and information  invaluable. Picture below. Best colours in Powerbait have been Lime Twist, Orange, Sherbet and Lemon Twist. The new Gulp Trout Bait is a new 55% stronger scent . Chunky Cheese and Rainbow Candy have been the the pick of the colours. Try the two hook rig below for best results. 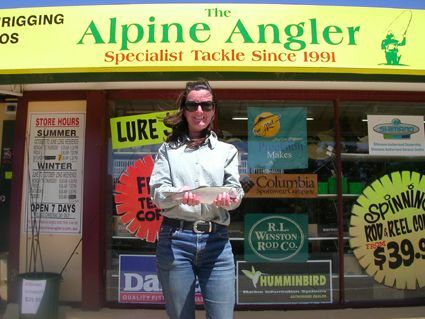 To all anglers fishing anywhere in the Snowy Mountains area. Please don't leave your rubbish on the shores of the lakes, or the banks of the stream. Take it home or dump it in a rubbish bin. Serious anglers are sick of cleaning up after the thoughtless few.